Broken Head Holiday Park for Byron Bay Sample Food Festival stays. Last year, the Byron Bay Sample Food Festival held at the Bangalow Showgrounds attracted over 10 000 food lovers from all over New South Wales. Event organisers are expecting an even greater influx of people as news of the festival spreads and it grows in popularity. The festival is centred around over 20 restaurants from the surrounding areas competing for the coveted Silver Fork Awards for 2013. But the main attraction for foodies is the chance to taste and sample exactly the same foods that the contest will be judged on. To really make the best of all the glorious dishes that will be available, it is definitely advisable to make a day of it. Those of you who don’t reside in the immediate area, may want to consider spending a night at Broken Head Holiday Park after the days festivities are done. The Holiday Park is situated just a few kilometres from the Bangalow Showgrounds and is set on the borders of the National Park with the added bonus of being situated on the coast of the Pacific Ocean. With all that is on offer, you may even want to consider making a weekend of it, or even stay for an extended holiday. Broken Head Holiday Park offers different types of accommodation to suit the varying needs of all types of food lovers who will be eating their hearts out at the festival. From camping and caravanning sites to beach side cottages and cabins, there is sure to be something that meets your overnight requirements. If you are planning on bringing the whole family, you can book the Holiday House that meets the need for a larger number of beds. Be sure to check out all the different seasonal specials that are on offer at this time of year for each of the different types of accommodation facilities. 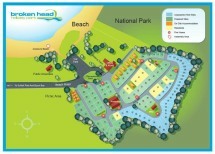 Dining is available at a number of fantastic restaurants nearby Broken Head Holiday Park. The most popular of these seems to be the Balcony Bar and Restaurant. This is the ideal spot to end the day with a cold cocktail and food from Chef Juan Hernandez that will titillate your taste buds. Although you can’t leave Broken Head Holiday Park without taking the time to have dinner at this restaurant, their breakfast and lunch menus also sport items that are to be raved about. With the Byron Bay Sample Food Festival just around the corner (official date – 7 September), you need to make your reservation now so that you can enjoy the wonderful atmosphere and activities that Broken Head Holiday Park and the surrounding area has to offer.